Yes! You can indulge yourself in an exclusive, behind-the-scenes experience led by an expert member of our animal team. This in-depth 3 hour adventure will expose you to a side of Out of Africa not otherwise seen. 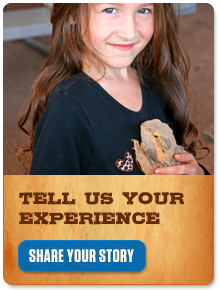 Don’t just see the animals, get to know them on a deeper level in a more personalized and interactive way. Your seasoned park guides will expound on many exciting stories, giving you a remarkable perspective of the animals, their personalities, behavior, history, and the conservation efforts to protect these marvelous creatures. For more information, click here for our premiere VIP Experience.